Born in 1912 in Pennsylvania, Barton Mumaw was raised in Florida, where he saw a life-changing performance by Ruth St. Denis and Ted Shawn in 1928. In 1930 he studied at Denishawn, a pioneering school that also helped to launch the careers of dance legends Martha Graham, Doris Humphrey and Charles Weidman, and performed with the company the following year at New York's Lewisohn Stadium. During the next two seasons, Mumaw toured with Ted Shawn and His Dancers, and he was with Shawn in his very first summers at a Massachusetts farm that would later become known as Jacob's Pillow Dance Festival. From 1933 to 1940, Mumaw was a primary force in the groundbreaking tours by Ted Shawn's Men Dancers, creating leading roles and performing in more than 750 cities across the U.S., Canada, and England. After the Men Dancers disbanded, Mumaw launched a solo recital tour and was hailed as "the American Nijinsky". As a soldier during World War II, he performed in a variety of shows for American troops. He continued in popular entertainment after the war, appearing on Broadway and in touring productions of such shows as Annie Get Your Gun, Out of This World, and My Fair Lady, working with choreographers Helen Tamiris, Agnes de Mille, and Hanya Holm. 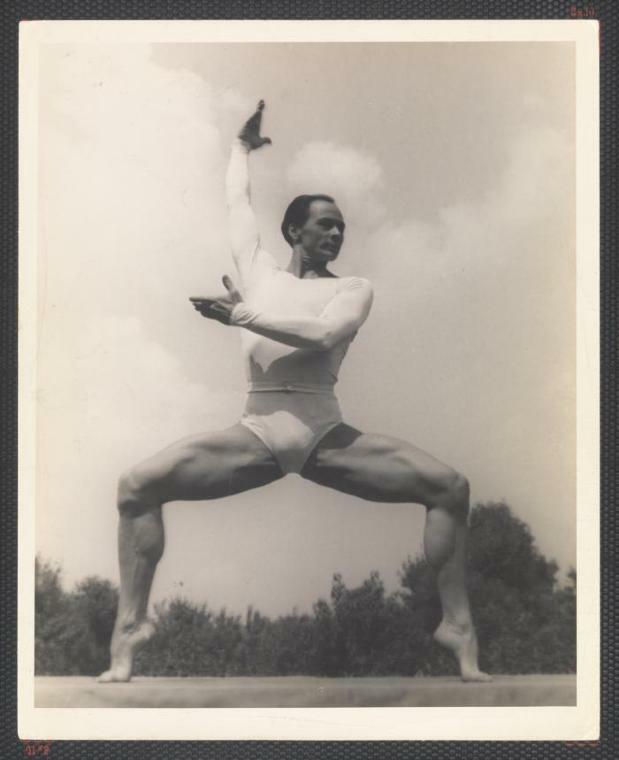 After Shawn's death in 1972, Mumaw devoted himself to perpetuating the Shawn legacy through such activities as staging Kinetic Molpai for the Alvin Ailey Company and teaching master classes and workshops throughout the country. He continued a lifelong association with Jacob's Pillow, including stints as Associate Director as well as serving as a frequent performer and teacher. His last dance appearance was in the Pillow's Ted Shawn Theatre in 1981, and he returned the following year to stage several Shawn works in commemoration of the Pillow's 50th anniversary. It was during these anniversary celebrations that Mumaw was filmed for the award-winning documentary, The Men Who Danced. He also coached revivals for a 1991 Shawn centennial program known as Jacob's Pillow's Men Dancers, seen at New York's Joyce Theater and on tour both nationally and internationally. In 1986, Mumaw collaborated with Jane Sherman on a critically-acclaimed memoir, Barton Mumaw, Dancer: From Denishawn to Jacob's Pillow and Beyond. He revealed the personal side of his relationship with Shawn in the book, which was reissued in paperback in 2000 and provided the occasion for Mumaw's final visit to the Pillow for an autograph party. Barton Mumaw died in 2001 at the age of 88. The final resting place for Mumaw's remains is at Jacob's Pillow, where his image on the theatre's weathervane (inspired by his Bach Bourrée) continues to preside. This collection comprises the original correspondence, manuscript notes, personal papers, press clippings, audio-visual recordings, costumes, books, photographs and framed items belonging to Barton Mumaw, a founding member and principal dancer of Ted Shawn’s Men Dancers (1933-1940) who continued a life-long association with Jacob’s Pillow Dance Festival as a teacher, performer, and advocate for Ted Shawn’s legacy. [Identification of item], Barton Mumaw Collection. Jacob’s Pillow Dance Festival Archives, Becket, MA. The Barton Mumaw collection is comprised of materials spanning Mumaw’s lifetime. There are scrapbooks of family photographs kept by his mother, personal correspondence, professional papers, lecture notes, press clippings, formal portraits, snap shots, and dance costumes which trace Mumaw’s personal and professional relationships and activities. The extensive personal correspondence between Ted Shawn and Barton Mumaw, mostly from 1940-45 while Mumaw was in the service, is significant in that the letters document activities at Jacob's Pillow and Shawn's life during this time. These letters were later used by Shawn to draft a subsequent manuscript of his autobiography One Thousand and One Night Stands. Mumaw’s prolific personal correspondence with friends and colleagues is also evident in the vast amount of letters, cards and press clippings in the collection. Also of note is the rich correspondence with Jane Sherman, a Denishawn dancer from the 1920s, that began in 1977 when they formed a relationship as co-authors of his autobiography. Sherman’s voluminous correspondence, sometimes daily, included photographs and newspaper clippings, continued until Mumaw’s death in 2001. There are many notebooks and handwritten papers filled with notes for lectures, essays, and speeches. There are also copious notes on choreography, the history of dance, and acting. Correspondence and papers from Mumaw’s later years in Florida attest to his relationships with dance faculty and directors of several Florida universities and organizations. Published books in the collection are mainly on the subject of dance, some books that belonged to, or were authored by, Ted Shawn, and many books by Lucien Price. Most of the books are inscribed to Barton Mumaw or Ted Shawn. The photograph collection consists of hundreds of solo dance portraits of Mumaw in various roles and costumes. Other formal portraits include well known dancers such as Ted Shawn, Ruth St. Denis, Lisa Parnova, Nala Najan, and Richard Cragun. Many informal snap shots are related to Jacob’s Pillow staff, teachers, students and dancers, and to Mumaw’s life in Florida with his partner Marvin Morgenstern. Also of note are the photographs documenting the 1942 summer season at Jacob’s Pillow from the scrapbook of Esther Miller, the Jacob’s Pillow cook at that time. Also from that decade are photographs Ted Shawn sent to Mumaw while in the service which document Jacob’s Pillow’s development during the early 1940s. Mumaw also inherited the personal photographs collected into scrap books by Mazie Mumaw, Barton’s mother, which range from her childhood family photographs to her marriage to Barton Mumaw Sr,. to Barton Jr. as a young boy and young man. Framed items include a painting and drawing of Mumaw, as well as several photographs of Mumaw and his parents. The audio-visual material contains record albums, tape reels, and tape and VHS cassettes. Of note is a tape reel of Mumaw in the South Africa news from 1950 and a tape cassette of Mumaw on a National Public Radio show. Many of the VHS cassettes are taped from broadcasts of dance performances. There are also recordings of Mumaw’s lectures, programs about Delsarte, and dances by Ted Shawn and Ruth St. Denis. The collection also contains costumes, including hats, shoes, and gloves, worn by Barton Mumaw from many of his iconic dances such as Pierrot in the Dead City, Bach Bouree and Fetish. Mumaw’s leather make up case contains a mirror, face paint, a sewing kit and cloths. The Barton Mumaw Collection is arranged into 8 series based on subject and/or format.